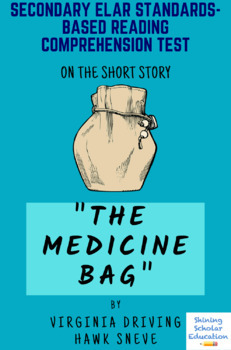 This 54-question multiple-choice reading comprehension and analysis test on the short story “The Medicine Bag” by Virginia Driving Hawk Sneve has questions from different levels of Bloom’s Taxonomy (revised). 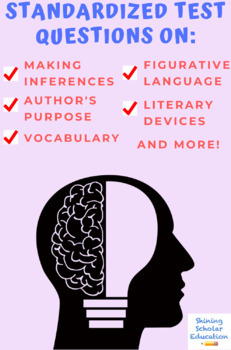 It will test students’ literal and interpretive understanding of the selection including: plot development, characterization, author’s purpose, point of view, making inferences, vocabulary, literary devices, figurative language, fact & opinion, analogies, and other elements of literature. 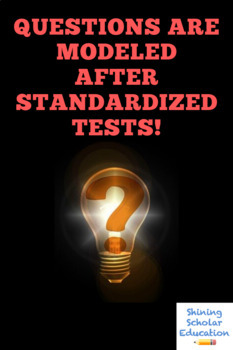 Questions are modeled after standardized tests (SAT, ACT, and state tests) to familiarize students with the structure and vocabulary of standardized test questions. Questions are spaced 1.5 lines apart for comfortable reading. The questions also encourage students to go back and re-read key parts of the selection, a crucial skill for comprehension and improving reading stamina. Teachers are encouraged to remove/add questions as they see fit for their students. Answer key included. Editable MS Word Doc. You can use this product for years and years! Feedback is always welcomed and appreciated! --it allows you to become a facilitator! 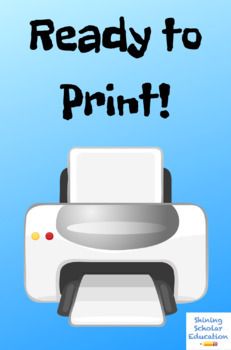 Check out these other awesome resources! Inspirational & motivational eBook "The Little Book of Big Quotes"
Class Vote Cards for Student Titles (MVP) Most Valuable Pupil, etc.